The Hawkeyes are preparing to trump the Terrapins and finish with a win over Knights. 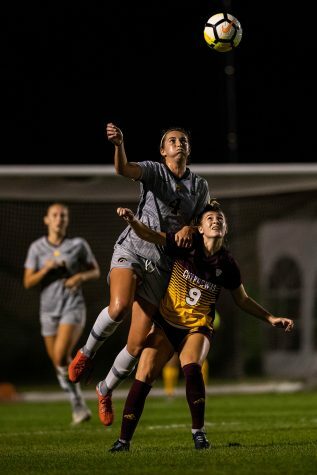 Defender Hannah Drkulec fights for the ball during a game against Virginia Commonwealth University on Sept. 2, 2018. 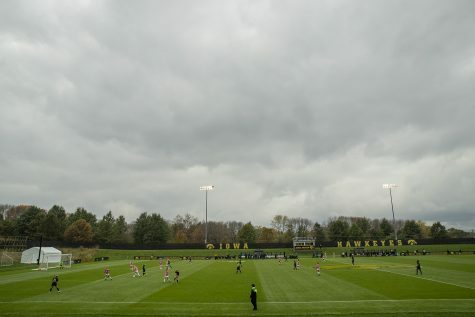 The Hawkeyes won the match 2-0. 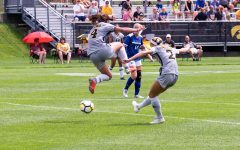 The Iowa soccer team will start its Big Ten play this weekend with two road games against Maryland today and Rutgers on Sept. 16. This is the second-straight weekend that the Hawkeyes have a road trip, and they hope to not repeat the rough outcome from last weekend. They have spent the last week working on set-piece defense, ball security, and finishing on offense — their weak points. 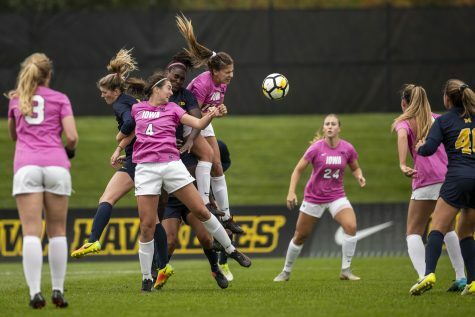 With a 4-2-2 nonconference record, the Hawkeyes can make some noise if they make the correct adjustments. 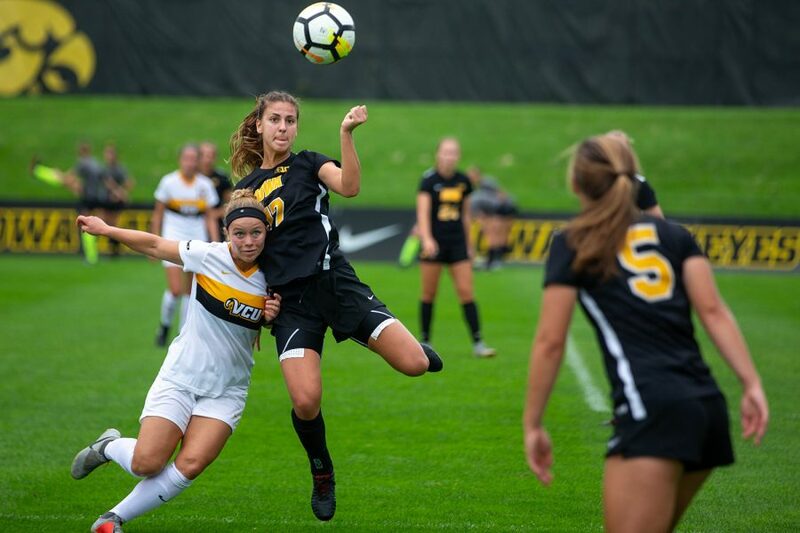 With a strong defense that has only given up 4 goals in seven games, the Hawkeyes should feel confident on that side of the ball in conference play. The part they should worry about is ball protection and finishing their chances — if they can just connect on the ends of their offensive possessions. 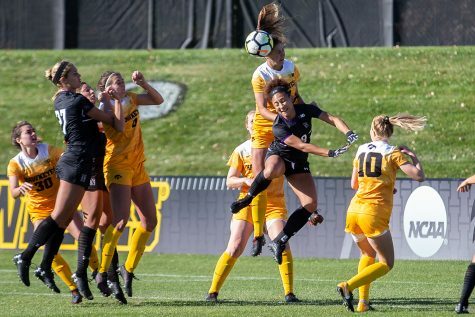 “I think after coming off our tough weekend, we want to come in with a bunch of energy and just keep our mentality up high … and also just finish our moments because we know we can get those opportunities and chances we just have to put it away,” forward Natalie Winters said. Energy and a positive mindset will be good for the Hawkeyes, because they have to be positive to be able to make any real changes to their game. They know they can get their chances; all that matters is finishing them. 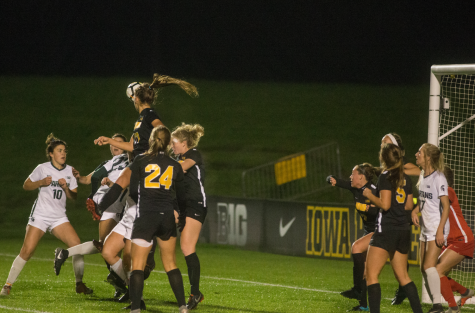 Defending set pieces better is Iowa’s second focus point. 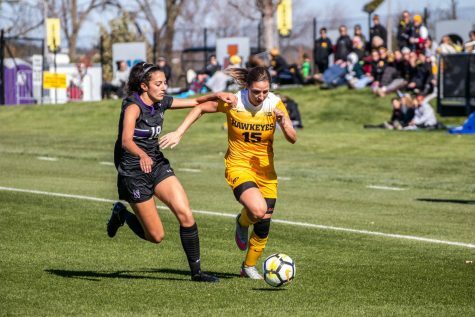 With all 4 goals scored against them coming on set pieces, the Hawkeyes will try to improve on the grit and strength of their defense. Iowa’s third focal point should be starting off on a better foot in the first half. The Hawkeyes seem to lag behind in the first half and then pick it up after halftime. 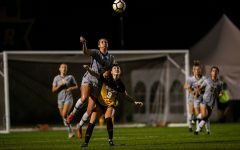 If they can get off to a strong start early, their defense can do what it has all season and ensure they will maintain the lead throughout the game. With these three changes, the Hawkeyes will be a strong team in the Big Ten. 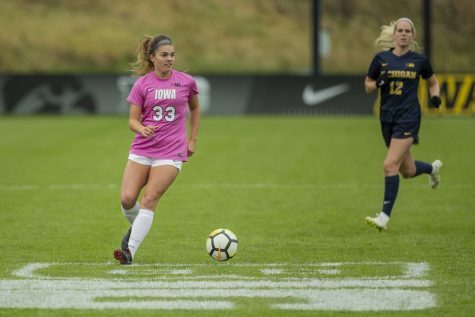 Their goalkeeping and normal defense are nothing the Hawkeyes need to worry about. They have managed to keep the games close when their offense isn’t up to par or can’t finish. With the slow starts they keep having, their defense is the No. 1 thing keeping them in the game. Maryland heads into the weekend at 2-3-3, and Rutgers is 4-1-2, so the teams look pretty evenly matched. 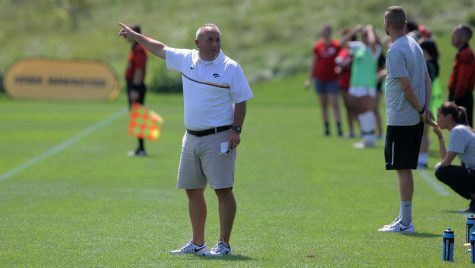 If the Hawkeyes can execute their game plan with the focal points DiIanni has preached in practice, they should not have a problem starting off hot in the Big Ten.